Sarafina is excited to be at the beach for the first time ever. She’s dressed and ready for fun when her cousin George appears, with a brand new flying saucer, and asks Sarafina to play catch with him. But catching the flying toy proves to be more difficult than Sarafina first thought. She’s going to have to keep her eyes open and paws out if she wants to take part in this game. But can Sarafina learn it fast enough? 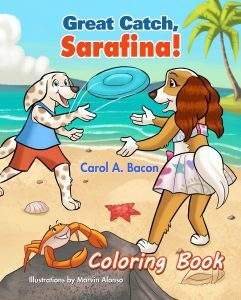 Follow Sarafina as she experiences the challenges and joy that comes with learning a new activity. This coloring book compliments the picture book story and is great for children ages 4-8. Sarafina has a unique name. Getting her first dog tag with her name is a very exciting day for her. At her new school, she slowly learns that classmates aren’t always so kind. The result is Sarafina being teased and bullied about her name. With the love of her parents and support from her teacher, she quickly learns the secret of how to turn a not-so-wonderful day into a great day. Meet Sarafina, a little puppy who teaches kids to overcome teasing with her positive attitude. This coloring book compliments the picture book story and is great for children ages 4-8. “Sarafina is nervous about going to school, but she’s also excited because she’s going to be showing off her new necklace with her name. But when the other children make fun of her name, she starts to feel self-conscious and embarrassed about it. Fortunately for Sarafina, her teacher is there to help her understand that having a unique name, a longer name, is actually a whole lot of fun. 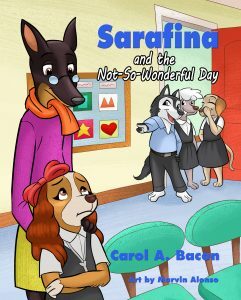 Sarafina can help the rest of the class understand the important things that she can do in Sarafina and the Not-So-Wonderful Day by Carol A. Bacon. This book is all about a little puppy who wants to be proud of who she is, but feels like she’s not as important as her friends at school. This is something that a lot of small children go through when they go to school. They get picked on because of something about themselves that they want to be proud of. They definitely deserve to see how important they are and why they should be celebrated. The children in this book figure out that there’s something really cool about being different and I think this will be a great message for other children as well. “Picture book readers age 4-8 years will delight in the pairing of Marvin Alonso’s colorful art with Carol A. Bacon’s story of young Sarafina, who experiences a fun day of shopping alongside her parents for a necklace with her name on it, all in preparation for her first day at a new school. This makes her feel special and loved – but when everyone laughs at her long name and teases her, Sarafina realizes she’s not really special; but odd. Nobody else has a name with so many letters … nobody but the teacher. How can Sarafina feel better about herself? And how can she deal with class bullies determined to bring her down? The array of animal protagonists (all gussied up in human clothing) and their encounters lends a whimsical and fun feel to a story where a young schoolgirl struggles to find her place in a new classroom. Kids receive many lessons from Sarafina’s story; from self-esteem and the differences between parental and peer approval to how to handle conflict and turn bad experiences into good ones. It’s an early primer on facing life’s conflicts head-on and with a positive attitude. Parents choosing it as a read-aloud will find that the story of Sarafina offers many jumping-off points for discussions of courage, conflict, and crafting win-win situations from ego-bashing encounters. “Great Catch, Sarafina! 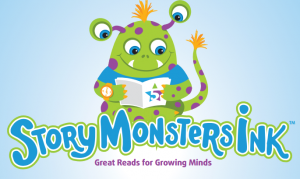 by Carol A. Bacon is a charming story that conveys a good message to young readers. Through the story of Sarafina, readers are taught how to keep trying to achieve whatever they have set their hearts on and to never give up. Sarafina is at the beach and it is a sunny, windy day. She is basking in the beauty of the day when she hears her cousin George calling out to her. He has a new toy flying saucer and he wants Sarafina to play with him. He tells her how to play and they start playing. Sarafina realizes that playing with the toy flying saucer is not as easy as she thinks it is. She knows it is going to be challenging to understand and play the game. Will Sarafina be able to learn how to play?